The second location of Jonathan’s the Rub (JTR) opened in the Memorial Green development at 12505 Memorial opened on October 4. 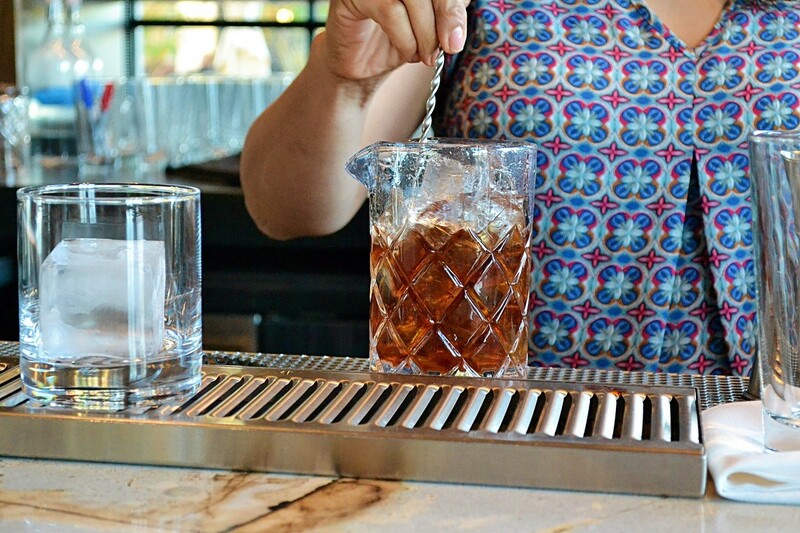 While the original location at 9061 Gaylord has long been known for chef-owner Jonathan Levine’s steak, chops and amiable BYOB policy, the Memorial brings something new: well-made classic cocktails developed by industry veteran Linda Salinas. Houston Food Finder was invited in to try some of the new drinks. “Jonathan really wants this location to be the place for cocktails in Memorial,” says Salinas. Salinas earned a reputation as a “cocktail queen” after designing other Houston drink lists for Hungry’s, Upstairs and La Grange as well as working behind the bar at Anvil Bar & Refuge, Julep and The Pastry War. 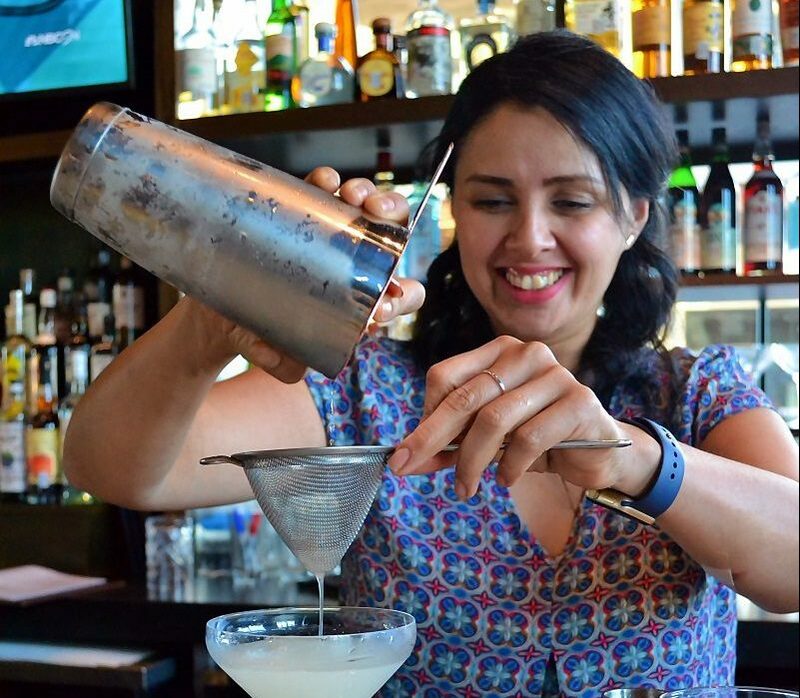 When she was tapped by Levine to put together the bar program at JTR, she decided to create cocktails with high-quality spirits that are “easy to teach, simple to make, and won’t require a Ph.D. to understand.” Salinas say she believes that patrons “shouldn’t have to sit through a class” to enjoy a cocktail. Linda Salinas strains the Greenback cocktail at the new Jonathan’s the Rub location at Memorial Green. Photo courtesy of Jonathan’s The Rub. Salinas proudly told us that all of the juices used in JTR cocktails are made in-house and have a two-day shelf life maximum to ensure quality. After “lots of research”, Salinas also decided to make all of the ice in-house instead of ordering custom pieces. This includes normal sized cubes as well as the oversized cubes that JTR uses both in cocktails and one large rock that will melt slowly without watering down a whiskey-on-the-rocks order. The cocktails features a wide variety of spirits and are affordable. Prices are between $10 and $12, which is like a breath of fresh air considering the current trend of new restaurant and bar lists sporting $16 and $18 drinks for fairly standard ingredients. Prices get even better during the 3 to 6 p.m. happy hour Mondays through Fridays, when cocktails like the Hendricks G&T by the Sea and the Suntory Toki Highball are only $7. There are also eight wines available for $7 per glass and multiple craft beers are only $4. Groups can also order pitchers of shared cocktails such as the Pimm’s Cup or the rosé wine and cucumber liqueur-based Endless Summer for $36. Shared cocktails easily serve four. The Cosmo-naut combines Aylesbury vodka, dry prosecco, lemon juice and apricot preserves into a very enjoyable cocktail that avoids being cloyingly sweet. 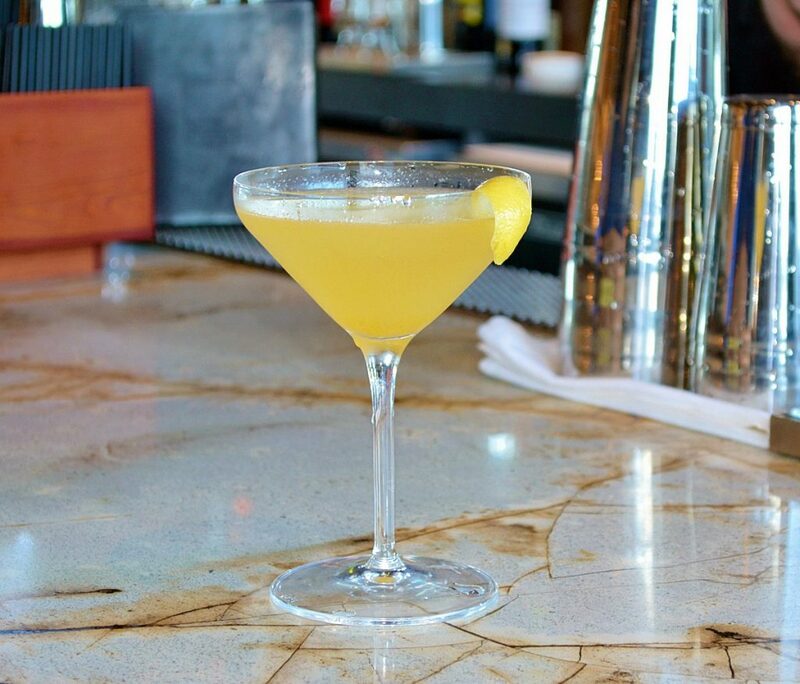 This shaken and strained libation owes its golden hue to the apricot preserves. We enjoyed the addition of prosecco which worked well with the apricot to wake up our palate and kept us coming back for another sip. The Greenback is an simple recipe: Fords gin, Tempus Fugit crème de menthe and lime juice with a lime and mint garnish. This drink calls to patrons well before its delivered as the peppermint and fresh mint scent subtly consumes the bar area. The incredibly bright and refreshing beverage highlights the crème de menthe — an addition of which Salinas is clearly very fond. The minty notes also make the drink perfect for the holidays. The whiskey drinker in us got “so caught up” in the .38 Special. Rittenhouse rye, Laird’s Applejack brandy, Carpano Antica Formula vermouth and Amaro Nonino Quintessentia combined to create a cocktail that we’d drink before, during and after the meal. The peppery spice from the rye whiskey was kept in check by the sweet notes in the brandy. Citrus notes were provided by the Amaro Nonino and the vermouth delivered a soft punch of vanilla. Stirred and served over one of JTR’s huge house-made ice cubes, this glass was returned bone dry. On a side note: the Memorial Green location also just launched its lunch menu that includes build-your-own salad options, hot sandwiches like the Iowa Skinny—a pounded fried pork cutlet with tomato, pickle, and mustard on a sweet sourdough bun, and Jonathan’s award-winning, 10-ounce burger. The star of the lunch menu is The Rub Chicken Fried Steak—eight ounces of prime rib-eye with bacon white gravy and fries. Lunch is served 11 a.m. to 3 p.m. while the original location remains open for lunch from 11 a.m. to 2 p.m.
Every dish at Jonathan’s is seasoned with “The Rub” — the namesake special seasoning that Levine perfected over months at the original location. We asked if we’d eventually see a cocktail with The Rub in the drink or on the rim and Salinas assured us that it wasn’t going to happen. That tells us that the new Memorial Green location is serious about making great cocktails instead of trying to do too much. Don’t be surprised if it becomes the new hotspot for cocktails in Memorial.